Located on the shores of the Pacific and surrounded by gorgeous countryside, Surfarm is the ideal place to relax and unwind. You will be surrounded by local quinoa plantations, the playful horses on the property, and our gorgeous deserted beach. Our hostel is located 12 kilometers from the center of Pichilemu, which allows for tranquility and complete relaxation that no other hostel in Pichilemu can offer. For those who love to surf, access to Punta de Lobos is easy and local surfers are always willing to show you some of the secret spots that they love. If surfing isn't your style, our idyllic and private location is perfect for anyone looking to relax during a long journey, or take a quick getaway as a couple. Surfarm isn't just a hostel... we're an experience that will help you recharge, unplug, and relax in the beautiful surroundings of Pichilemu. FREE daily transfers to the surf spots!! FREE PICKUP from Pichilemu bus terminal for the Pullman del Sur bus leaving Santiago at 12.00. 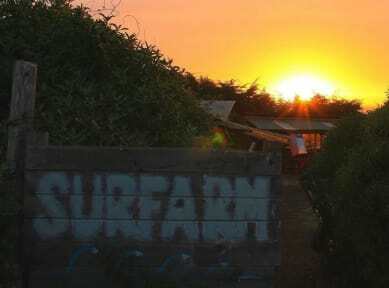 There are a number of activities available year round at Surfarm! Guests can enjoy surf lessons with professional surfers and surf equipment rental, with options for both beginners and more experienced surfers alike. 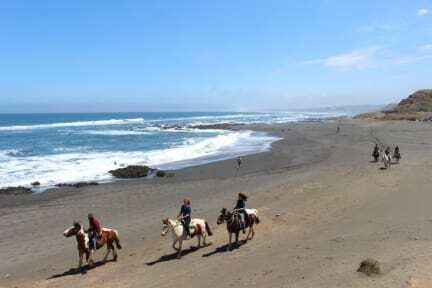 As well as surfing we are also able to arrange guided horseback tours along the beach, which allow you to get to know the dramatic coastline near the hostel. We have a slack line, skate ramp and balance boards which guests can use free of charge to pass the afternoon... not to mention hammocks for those lazy days.